Once we have received your registration form we will send you the first volunteer newsletter by email, that will provide you with detailed information about volunteer roles, how the race works and what to bring. As we get closer to the event we will provide you with additional details to prepare you for the adventure ahead and to ensure that all the necessary logistics are taken care of for your time with us. Although we are hoping that all volunteers will be self-sufficient during the race, we will do our best to make sure you have everything required. Expect to bring most of your own food and gear -- we are working hard to get as many food and equipment/product donations from companies for you as we can manage. Many roles require you be comfortable in the wilderness, as each race will be in a fairly remote areas, so please come prepared. We will let you know in advance whether you will be camping in a remote access area, near your vehicle or at one of our camps so that you can plan your requirements appropriately. For most volunteer roles we will need you to arrive the day before the start of the race. Although we will give you most information prior to race(s) dates, there will be detailed information necessary to go over with you in person which will be done in a pre-scheduled, one-on-one meeting with one of our staff. This will give us the opportunity to better get to know you and answer further questions. It will also provide a chance for you to meet and get to know the competitors and fellow volunteers before the race starts. After registration, everyone will camp out at base camp before heading to your role the following morning (Note: In most cases you will have the option of booking hotel accommodations at a special rate at the host site). All volunteer roles will have a minimum of two people per station. Most tasks will last the duration of the race, and we hope that everyone will be able to stay for the party directly after the race, as it will give the staff at Frontier Adventure Sports and the competitors a chance to say thank-you for your involvement and support. Volunteering at an adventure race is hard work. It can also be a very rewarding and a memorable experience. We will do everything we can to get you ready for your role and help you maximize your experience, but we will still be expecting a lot of you. As important as it is that we all have a good time, it is most important that the competitors are safe and well looked after. The following is a list of the major roles available at each race. Please read through all of them to see which roles most interest you. Checkpoint Staff: This is where we need the most people. Checkpoints are specific locations on the course that all teams must pass through. For many checkpoints, it will involve being stationed in fairly accessible areas. The role consists of setting up the checkpoint, recording each team arrival and departure times as well as their general condition and then radioing the information to headquarters. You will also be responsible for ensuring the site is left clean. Note: All checkpoints are staffed with a minimum of two people, so it's a great job to do with a friend! Remote Checkpoint Staff: This job is similar to the regular checkpoint but is usually deep in the wilderness. People wanting this role must be self-sufficient! Having your own camping equipment and the ability to carry it in for a stay overnight is a must. We will lead you in but you and your partner must be able to navigate your way out. Transition Area Staff: TA's are major checkpoints, and the only areas on the course where teams can meet up with their support crew to re-supply. This area will be stationed with a minimum of four people. In addition to tracking competitors, you will also be responsible for tracking support crews, building a communal fire, and initiating games for the support crews, awarding prizes to the support crew antics. It is a fun role but definitely requires organizational and leadership skills. Base Camp Staff: Base camp is at the finish line and serves as the command centre for the whole race. All team progress reports are relayed back to base camp to get entered into the master time spreadsheet and added to the spectator leader board. 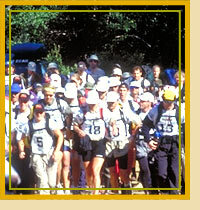 Teams must be tended to as they cross the finish line and equipment needs to be managed. Base camp is certainly more comfortable than a checkpoint and it has plenty of action. It is a good choice for those that are not as keen on being out in the wilderness. Dispatch Driver: If you know the land and the roads in the race area, this is the job for you! The dispatch driver will be responsible for picking up teams that have dropped out for various reasons, volunteers that need to get to the next checkpoint. A person with a four-wheel drive truck is preferred but not necessary and of course Frontier Adventure Sports will pick up the tab for any gas you use. Medical Team: Frontier has a great professional medical team. The AR Medics have years of experience and know what adventure racing is all about. If you can help them out let us know. Some medical staff assist in search and rescue situations while the majority monitor and assist teams as they pass through transition areas. Medical teams are positioned according to qualifications. If you have the minimal requirements of 1st Aid, CPR, or Wilderness 1st aid you can assist any of the qualified medics. If you are a qualified medic or above you will be in charge of caring for the competitors and assessing their condition as they come into transition areas. Massage Therapist/Physiotherapist: Once teams reach the finish line we want them to relax and get comfortable. Volunteers for this position need to participate only on the last day of the race. We will establish a massage/physio tent near the finish line of every race so you have a dedicated facility to work from. Each role listed offers some unique challenges and rewards and are suited to different types of individuals. List your top 3 choices on your registration form and we will do our best to put you in your role of choice. If you have any questions about any role listed please do not hesitate to contact us.